Some of us loved the aggressive wheels, others hated them. If the auto bailouts mean GM brings their Euro-flavored cars to our shores, we'll take it. Gone—along with several of the General's divisions—are the barely carlike road floaters that have long been popular with octogenarians. Now Buick is tackling head-on its competition from Acura, Infiniti, and other premium import brands. The GS is the top-spec Buick Regal, equipped with a heavily boosted four-cylinder engine and a real six-speed manual transmission. It makes 270 horsepower from a measly two liters, and has a GS button on the dashboard that makes the steering and suspension damping a bit sportier—and also adds a red glow to the gauges. Further proof that I'm getting old: I dug the Regal. And check this out: Our test car had a real, live manual transmission. No, it didn't have some manumaticical transmission controlled by those lame paddle shifters. It had a real stick with three pedals hanging under the dash. Right there, you gotta love it. What else? GM cars, especially Buicks, have come a long way lately, especially with regards to the interiors. I'd say it would be a tough call between this and the Optima. Okay, this one comes with a stick, but here's a question: Do I really want a manual transmission in my family sedan? Maybe the fact that I just asked that question proves that indeed I am getting old. I'll see you at the early bird. This car is nicely appointed, comes with some big wheels and talks the sporting game a whole lot. There's even a GS button in the dash which turns the gauges red and changes shock settings to "stiff." It responds well, drives comfortably, and in general feels like a very good car. Yes, it's "wrong-wheel drive," but lighten up. 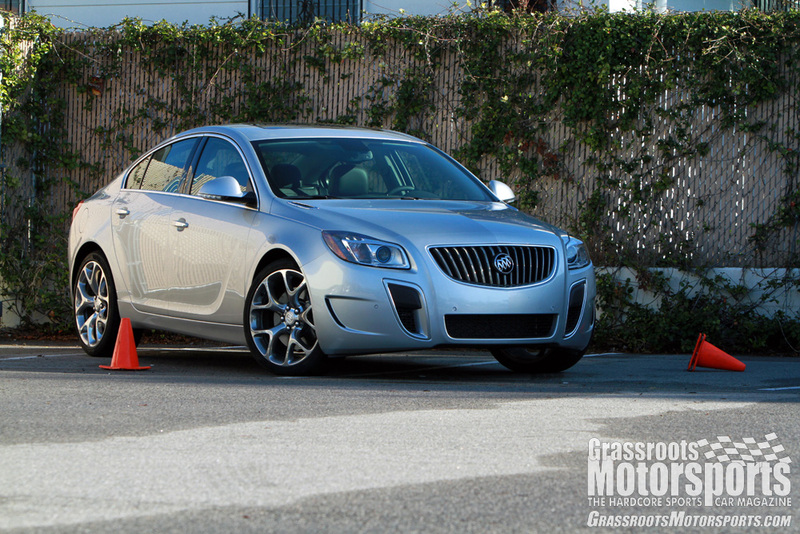 GM is offering their top-spec Buick (Buick! This is a Buick! A turbo Buick!) with a stickshift. My only complaint is that this highly boosted engine exhibits a decent amount of lag. You don't really get into the power until about 3000 rpm. Keep the revs up; that's where the fun is. at the TOP of my new car want list! Perhaps this will answer the question on the forum about whether only cheap buyers go for the stick shift. Color me impressed. Only downside is that price, especially vs. such contenders as the Optima and Sonata. 270hp, big honking turbo that comes in fairly late and hard, FWD.... sounds like a recipe for some pretty vicious torque steer. Now that I am back to work I see them every day. As a matter of fact there is a black one looking into my office as I type this. The best way I can describe the New Regal is this: General Motors has built a VERY GOOD Volkswagen Jetta. The base Regal is much like the high option package Jetta and the Regal Turbo is every bit as good as the Wolfsburg model and the GS is on par with the GLI. No Tq steer here. The redline is too quick though. This car is TIGHT. The brakers excellent. Handling rock solid and smooooth too. Excellent seats and steering wheel. I'd like another 100HP because the car just seems so all around capable. I'm guessing that the front end is polarizing, but I love it. Way better than the ugly stuff coming from Japan and Korea lately.